Washington D.C. (USA): Afghan Americans took to the streets in Washington D.C. to protest Wednesday's attack near Kabul's heavily protected diplomatic area that killed at least 90 people and injured over 350 others. 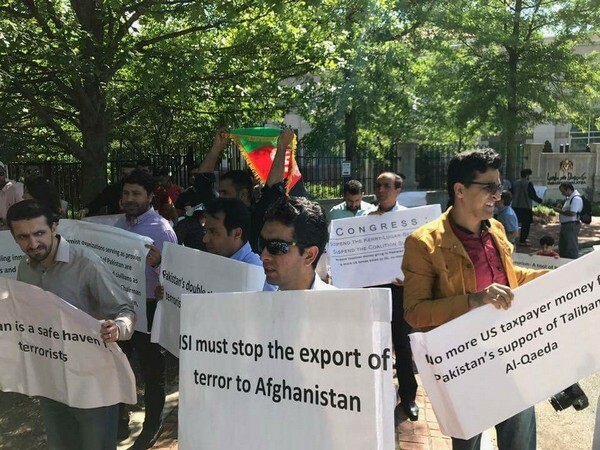 The protestors demonstrated in front of the Pakistan embassy and demanded that Pakistan be declared as a terror stake for its alleged role in the terrorist attack. The protestors said that Pakistan's intelligence agency, ISI, is equal to the Islamic State terror group. They said that several U.S. Congressmen have mentioned that Pakistan has long been a safe haven for terrorism. The protestors also urged the United Nations to form a special commission to investigate Pakistan's relations with terrorist groups. No group officially claimed responsibility for Wednesday's attack but Afghan intelligence officials suggested the Pakistan based Haqqani network - militants allied with the Taliban - carried it out with support of Pakistan. Pakistan has, however, rejected the claims calling them 'baseless'. Pakistan and Afghanistan frequently accuse each other of supporting and harbouring militants who carry out cross-border attacks. Afghanistan on Wednesday cancelled all planned cricket fixtures with Pakistan in response to the blast. It was one of the deadliest in Kabul in recent years. A tanker truck packed with explosives was detonated close to the German embassy near Zanbaq Square. Buildings, including a number of embassies, were damaged and more than 50 vehicles destroyed in the explosion.